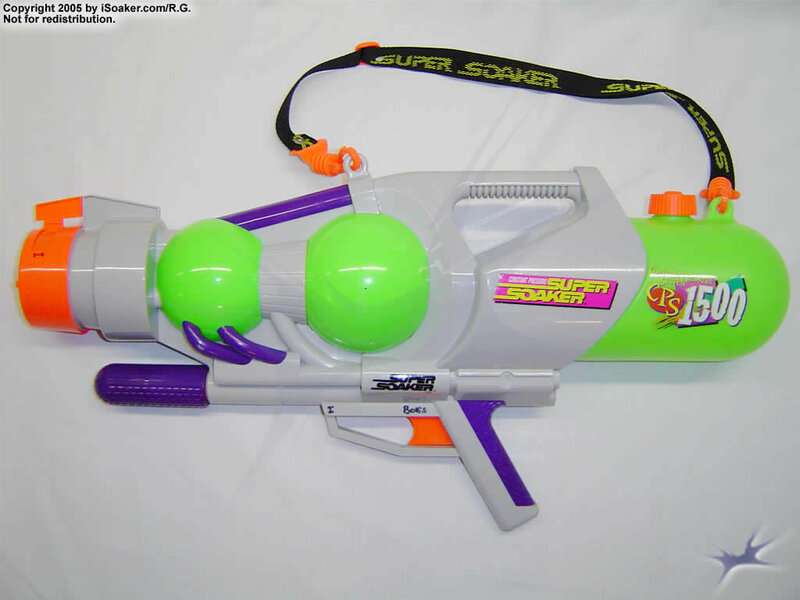 The Super Soaker CPS 1500 is the larger brother of the Super Soaker CPS 1000. While slightly larger than the Super Soaker CPS 1000, the CPS 1500 provides greater water power. At its front, there is a switch to toggle the nozzle size from 5x to 10x. In battle, the larger setting yields a thicker stream of water for use in quick victim water saturation while the smaller aperture can be used to extend the firing time of the blaster. Though the CPS 1500 has a 3.0L water reservoir, its maximum rate of fire can easily drain its resources. The shoulder strap allows one to carry this weapon even when climbing or if using another water weapon while its built-in handle facilitates refilling. Like the Super Soaker CPS 1000, this weapon can quickly drain is resources if the user is too trigger-happy. One should also take care not to run or fall with the pumping mechanism extended as this appears to be the most fragile part of this otherwise well-built blaster. The pump may break if not treated with proper respect. Sadly not everything is perfect here: It is, as often mentioned, very fragile. If you pump it fast, the thin pump may break, leaving the gun unusable. There is also no "water save nozzle(2 X::)" or "big Soak nozzle(20 X::)" . It's great power also sometimes lead to trigger break downs or other internal problems. The CPS 1500 is an excellent all-purpose blaster guaranteed to satisfy. It’s fifty foot range on 5x is great for long distance, while the 10x nozzle will drench any opponent and sent a shiver down their spine (literally speaking). It is not too heavy, and has a very smooth pump that makes no noise whatsoever, great for sneak attacks. This is the best rounded blaster of all time. All in all, the CPS 1500 is a blaster that will actually scare people. Soaker n00bs envy this beast. This blaster will receive respect on any battlefield. Just watch out for only Monsters and higher-end CPSs, such as the 2500, 3000, etc. The CPS 1500 from the start is a great soaker. Released in 1998 part of the legendary CPS line of Super Soakers, the 1500 doesn’t even have to say anything to impress and will blow away its competition into the middle of next week at least. There are so many things that make the 1500 such a great weapon, and also a consideration as being one of if not the best Super Soakers made. Where can I start, well the whole look, feel, balance, power and simplicity of this insane thing are fantastic. It has more power than the smaller CPS’s like the 1000 along with having a 10x nozzle added to the mix with a very simple, effective and well built nozzle selector. Because of this the whole experience of using in battle is great and makes it very offensive yet defensive when need be. Having a spherical CPS bladder is also great as it gives it that very explosive power, it really is like punching someone you want to get revenge on really hard in the face it’s that powerful for its size. Colours like with pretty much all the 98 CPS’s are simple and nice with grey, green and some orange which blend well together. Even though it holds 3L of water for its reservoir and an amazing firing chamber capacity of around a litre, it is still very light and feels good, which makes it so versatile. Pumping times aren’t bad either; however it does take slightly longer than smaller soakers given the firing chamber volume. When it comes to Super Soakers, the CPS 1500 really does shine, it’s like having a flash and fast car, and since they cost so much, the 1500 is the next best thing. Despite this, the 1500 still doesn’t have everything right. While it feels great and has everything performance wise you could need, the whole structure/sturdiness is lacking a little, as it does feel more fragile. The pump is not tracked so you need to be careful, it also lags a bit. The reliability is not the best which makes it harder to find a good one now. The main flaw I’ve had with one is that the trigger valve due to the amount of power has a chance of exploding/cracking, rendering it useless, even after a heavy repair, it still blew up after a while. To sum up basically, among the 1500’s made, there are a fair few dud ones shall I say, so watch out. It’s like searching for something buried deep somewhere and then whilst looking for it a snake jumps out and bites your hand, whatever it was you were searching for obviously wasn’t worth it as there was something wrong! One other final thing is that like with pretty much every CPS soaker, despite a 3L reservoir, you can still run out quickly if you treat the trigger as more than just a friend. Overall however, the CPS 1500 is a perfect soaker to buy for pretty much any purpose, providing you can find a good one. Despite the fact it is not fully reliable, once you get a good one you won’t look back in anger and blow your head off. If you have a bigger budget and want a soaker that has the features of the smaller CPS blasters like the 1000 plus a fair bit more without sacrificing mobility, then the 1500 is perfect, it is one of my favourite soakers I’ve been able to use in my time. You can pretty much take on anything, even the larger CPS’s due to the power and mobility and high enough nozzle settings for any situation. You’ll need a CPS soaker to be effective and also older XP’s if you are skilled enough to be a good match. A large CPS like the 2500 while competitive is still hard again due to the 1500’s near perfect balance. If there were something like a Rolls Royce among water guns, the CPS 1500 would be it. It is rare to find one, some structure flaws, out-performed by bigger, newer models, but so well rounded in power, size, ability, and classiness that one has to say that they don't build them today like in the good old days. The CPS 1500 has around the same power as the CPS 1000 with a 5X and 10X nozzle. It has a strap and a big tank to take on every soaker. The colouring and shape is what I would expect from a good old water gun. The pumping is so quiet that one almost does not hear it while pumping the water into the pressure tank. Its the ideal weapon for sniping and stealth missions. Its drawback is the fragile pump which can be broken if one pumps to wildly. Other than that, you can go head to head against any other soaker except the ones with 20X nozzles and the MXL's dual nozzles. This soaker is a must have for every water fighter and soaker collector and if you have the rare opportunity to buy one, do it. This review will be short and sweet so I will not deluge into the nozzle details. This blaster has good range as I have tested it in a recent band trip. Although the small reservoir will be sucked dry in about 3 full shots, it can still pack a punch. Power is great, no hassle with the nozzles, and I was maneouverable enough to run with it. A con is it has a rather fragile pump handle, although it has not broken on me, yet. The CPS1500 is a very well rounded gun and should be included in anyone's arsenal. Pros: Light enough to run with, heavy enough to soak with. Good range on both nozzles. Cons: Small water tank, fragile pump handle, and may not be able to compete with anything like the CPS3000 or above.